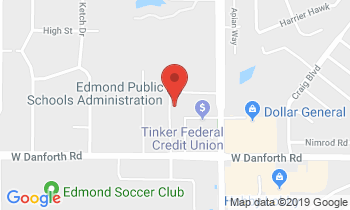 Edmond Schools is seeking input from the public to help name its newest elementary school which will be built on the southeast corner of Coffee Creek and Douglas. The bond-funded school is scheduled to open in 2021. Click the link to submit names or individuals may have the form emailed upon request by contacting dana.elkins@edmondschools.net. Forms should be returned by mail to Price Brown, Executive Director of Elementary Education, EPS Administrative Center, 1001 W. Danforth, Edmond, Oklahoma 73003 and must be submitted by noon on Friday, April 19. A committee of patrons, teachers and district personnel will research the submissions and recommend potential school names to Superintendent Bret Towne for consideration. The Board of Education will then vote on the final name. Designed by the Stacy Group of Edmond, who also designed Frontier Elementary, Heritage Elementary, and Centennial Elementary, the new school will feature an abundance of natural light, stone, and copper to compliment the hilly, wooded terrain. To maintain the beauty of the land, the school will have tiered parking and stairs leading to the front entrance. The new elementary is Edmond Public Schools first school to be built east of I-35 and brings the total number of elementary schools in the district to 18. This new elementary school is the first school to be built east of I-35.